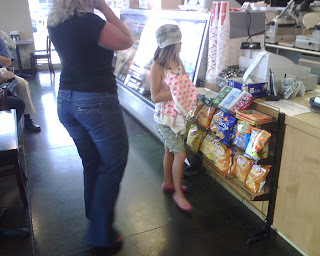 When Marrdy and I were at the deli picking up lunch today, the was the cutest little girl there. Always the friendly one, Marrdy approached this little girl and her mother. We found out at 8-years-old, she's already picking out her own outfits and telling her mom what stores she needs to shop at for clothes. You'll have to excuse the crummy pictures, but I didn't want to pull my real camera out of my bag and scare the poor girl and her mother. In other words, I didn't want to look like some psycho stalker lady. Both her hat and shorts were green camo, the hat having a pink edge to the brim. Her white tank had a faint pink pattern on it. On her arm, she had a white hoodie with pink hears all over it. Her pink jelly shoes made me want to buy a pair. 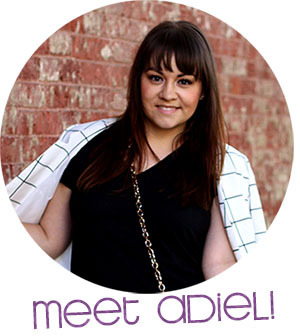 The silver sequined belt and purple necklace topped it all off. I couldn't believe she pulled this all together herself being only 8-years-old. A fashionista in the making? Wow. And here I am twice her age and I look like I get dressed in the dark. lol That's cute. i don't remember if you asked me to switch links. did you want to switch links ? Adiel, i don't remember if you asked me to switch links. She was so darling!! I loved her outfit and her personality! Next time I'll be bold and see if we can get picture with a real camera. But I love me some camo. Marrdy, yes we should've had backbones and asked her mother for permission to photograph her.